Every time August & September roll around, I feel like life hits a sudden refresh button. There are two reasons in particular for the sudden refresh: 1. Fall always brings with it a feeling of new beginnings, new opportunities, new friendships, new jobs, new semesters. I was talking to a good friend the other day, and we both decided that even though August can feel a little too stressful at times (with so much going on), it always seems to be preparing us for even better and more exciting things for fall (my f-a-v-o-r-i-t-e time of the year). Reason #2: I don’t know about you, but I’m always moving to a new place, new apartment, and new room every time I find September just around the corner. And with a brand new bedroom … came a brand new office (since, yes, I do work in my bedroom…All. Day. Long.). 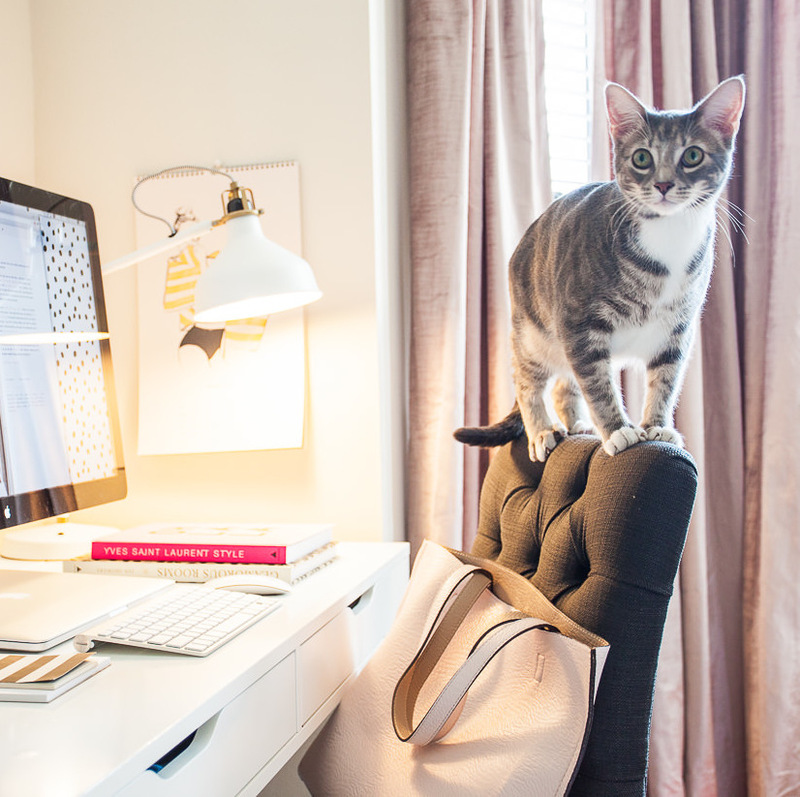 Since I spend so much time in my bedroom, a brand new office was the perfect opportunity to partner with one of my (all-time) favorite home brand around: Lulu & Georgia. If you’ve browsed Lulu & Georgia’s site, you already know how hard it is to decide on what to pull the trigger on – because girls, everything is beyond gorgeous. 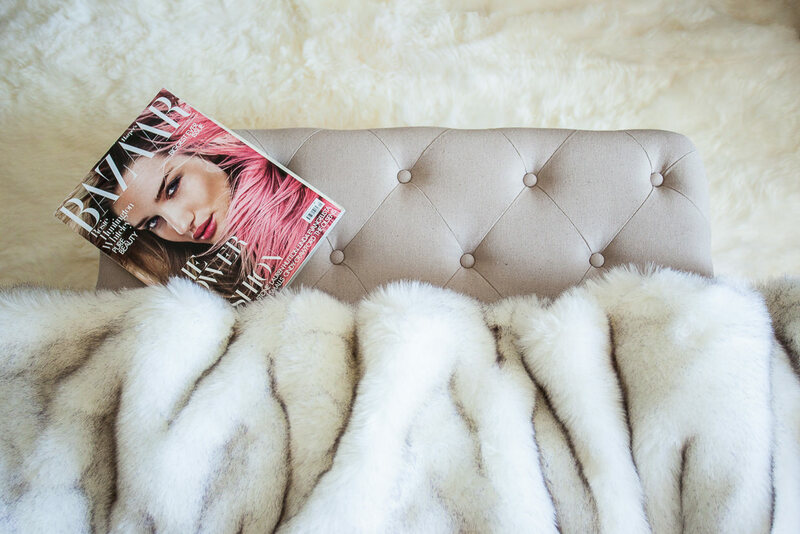 After spending [way too much] time on their site, I came to the conclusion that the notorious L & G sheepskin rug was an absolute bedroom and office staple. 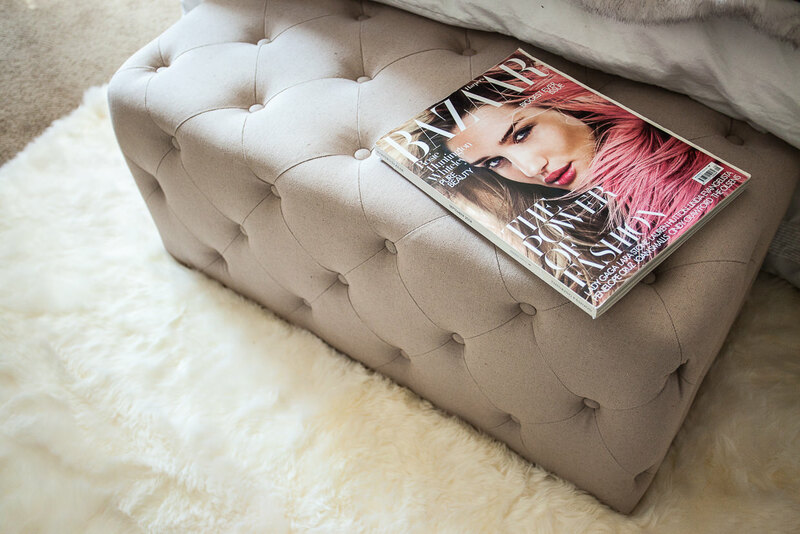 I also found myself swooning over the Antoinette tufted bench (swoon-worthy, mhmm), and also knew it had to be part of my new L&G collection. The rug is insanely soft-to-touch, incredibly comfy and cozy to lay on and definitely adds the right touch to a neutral-based room. 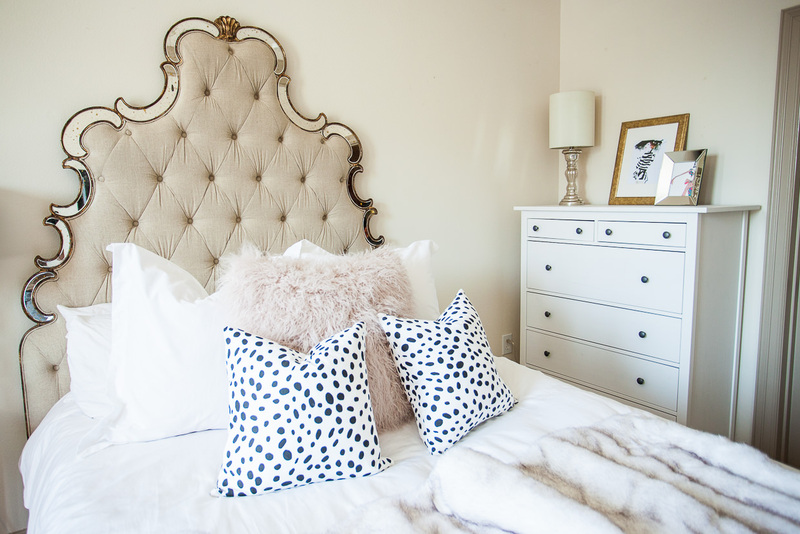 The cutie Antoinette bench serves as the perfect embellishment that sits at the foot of my bed, perfect for days I have girls over to the office for chit chats or roomie movie nights. Love the items you chose! I have to agree that picking items on their website can be a challenge because there is just too much cute stuff! The space looks fabulous! Lulu & Georgia has the most gorgeous pieces — I’m obsessed with the sheepskin rug. Your brother’s cat is so cute too! Love all of your picks! 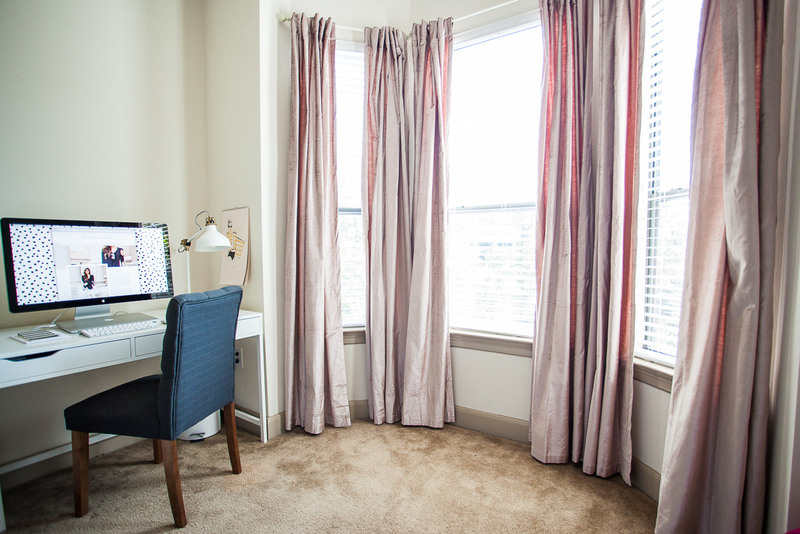 The room looks so chic and elegant and will definitely be a space you enjoy working out of. Very cute kittie, too! Love, love, love all of it! Especially the kitty. But what is that fabulous fur throw on your bed? THAT I covet!!! Everything is gorgeous. I love these pieces, and I could just picture myself jumping in that bed. It just looks so soft. Great office colors. love this room so chic !! Love your room! Where is that beautiful fur throw from?? so chic and glamorous! and your little kitty is adorable 🙂 I just got a new rug and it’s amazing how a few changes can make your entire space look so fresh! I love this style!! where did you find the head board? Hi Jessi, I was wondering if you could tell me where your bedside lamp is from? Re-doing my bedroom and your lamp is one of the first ones that I really like! Thank you!! Love this bedroom! So chic! What size pillows did you use to put it all together? Loved the post! what size did you get the sheepskin in?? actually the blanket will you please send the link! It is gorge!!! Please tell me where that fur throw is from. I need it. I’ll love you forever. Hi! Is that a king size bed? Or queen? Yes I love it. I want to lay in that bed. I love the wall color! What paint did you use? Love this room everything about this room so much! For the three pillows on the bed did you do all 18×18 or is the sheep one bigger? Im in love with this room! Where did you get the fur comforter/ throw on blanket? Love this room! It’s so elegant and beautiful. I have been looking everywhere for drapes like these. Can you tell me where I can find them? I know this post is very old, but this room is stunning!!!! 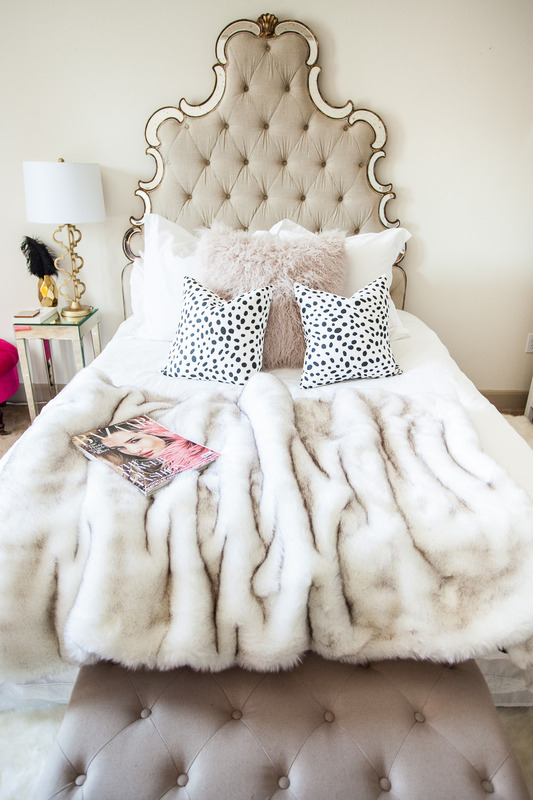 I especially love the fur throw. U mentioned it was sold out, but do u by chance know the brand? Thank u! Wow this site is truly lovely! Where do you get the fake fur blanket at? It looks amazing?